Quaker parakeets make delightful additions to the family. 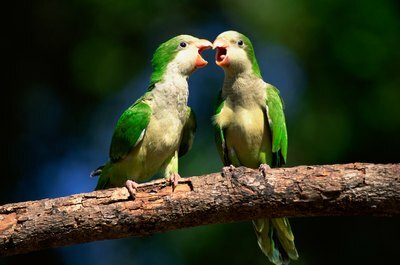 Quaker parakeets, also known as quaker parrots or monk parakeets, are highly active birds. They're mischievous and intelligent birds who provide seemingly endless entertainment with their vocabulary and antics. Choosing a well-socialized baby bird from a reputable breeder or adopting a quaker from a rescue can provide for a happy relationship. Meet with the prospective breeders at their home or breeding facility before you make plans to take a baby quaker home. Inspect the surroundings for cleanliness and for healthy, happy birds who are fond of people and have a distinctive bond with their humans. Do the same if you are adopting a quaker from a pet store or from a rescue society. Find out what diet the quakers are fed. You'll need the same, at least enough so you can gradually switch to the diet you prefer to feed yours. A seed diet is high in fat and shouldn't be the base of your prospective parakeet's parents' diet. A well-balanced diet includes high-quality pellets as well as fresh fruits and vegetables. Ask to see veterinary records to ensure the parents and babies are well taken care of. Interact with the clutch of chicks, or the quakers available for sale or adoption, upon their weaning age -- 8 to 10 weeks old -- or when you are able to take one home with you. Talk to them in a playful, yet calm, manner and see which ones come up to you. Put your hand down with the available quakers that have come to greet you or that are interacting with you. Hold each available parakeet individually and take notice of ones that seem to enjoy your company. quakers, like other parrots, are particular about who they like and don't like, so this small test of compatibility will prove helpful in your decision-making process. Choose the baby that fits with your personality and genuinely seems to enjoy your company and your touch. Contact your local humane society, animal shelter or avian rescue society if you're interested in adopting a quaker before making an effort to purchase one. Some pet stores are OK in general, but some staff members may not be well-versed in caring for quaker parrots or other birds in their care.